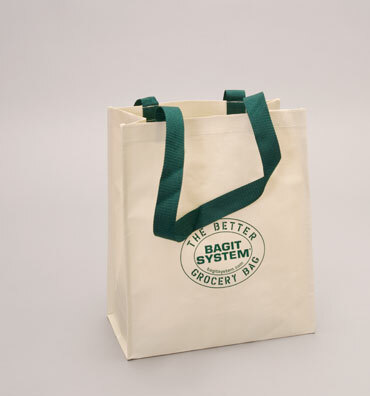 Bagit System’s® Grocery Bag Tote is perfect for every task. And it’s better than every other reusable grocery bag because it’s both the exact same size as the familiar brown paper grocery bag and — like that brown paper bag — it stands open even when empty for easy filling and handling. The Bagit Grocery Bag Tote has rugged, convenient top handles, and it folds flat when not in use. Heavy-duty construction, and this bag stands up and holds it shape an﻿d size whether empty or full. Available fully customized for your program, event, or retail outlet—colors, dimensions, features, construction, and sizing are all customizable. 1,000 pc minimum quantity.